Playwright Beau Willimon’s adaptation and updating of Henry Becque’s 1885 comedy “La Parisienne” -- set in present-day Washington, D.C. -- is reasonably intriguing and entertaining, if not, it must be said, entirely successful. 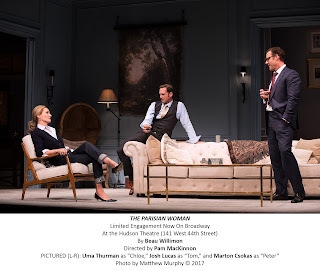 Uma Thurman, in her first appearance on the New York stage since CSC’s “The Misanthrope” in 1999, has the titilar role of Chloe (originally Clotilde), wife of tax attorney Tom (Josh Lucas) who has keen political ambitions hoping for appointment as a court of appeals judge. But, lo and behold, she has a lover on the side, here named Peter (Marton Csokas, a bit off his game at my performance), a White House insider and in the midst of a divorce. Tom takes that fact in stride (that being one of the elements which so scandalized 19th century audiences). Peter, for his part, can accept Tom in Chloe’s life, but obsesses about her having flings with others. Peter can help Tom get the judicial appointment he so craves, and so might Jeanette (Blair Brown), a DC power broker and soon to be head of the Federal Reserve. When Chloe and Tom are invited to one of Jeanette’s dinner parties, Chloe uses her charm to find out where her husband stands in the running for the position. While there, she meets Jeanette’s bright Harvard grad daughter Rebecca (Phillipa Soo), a liberal and Democrat, despite her family’s staunch Republicanism. To reveal more would be to give away some interesting plot twists. The frequent allusions to Trump -- not actually mentioned by name till the end of the play -- but otherwise identified pointedly as “him” or “the current president” (and some ruder terms), feel terribly forced, and though I can’t say I know Becque’s original play, one feels that the European sensibilities of the plot and characters don’t quite jibe with the updating. Thurman gives a confident, authoritative performance, and captures the enigmatic aspects of the character well. The women come off best, in fact, including Brown’s pitch perfect matron, and Soo’s youthful political aspirant. Derek McLane’s sets -- Chloe and Tom’s town house, Jeanette’s home, an elegant hotel -- are all lovely, and there’s a high-tech LED display separating the set changes (projections by Darrel Maloney). Jane Greenwood’s impeccable costumes and Peter Kaczorowski’s lighting are further pluses. I can’t say I was bored for a second, and minor though it is, “The Parisian Woman” provides a painlessly diverting evening.